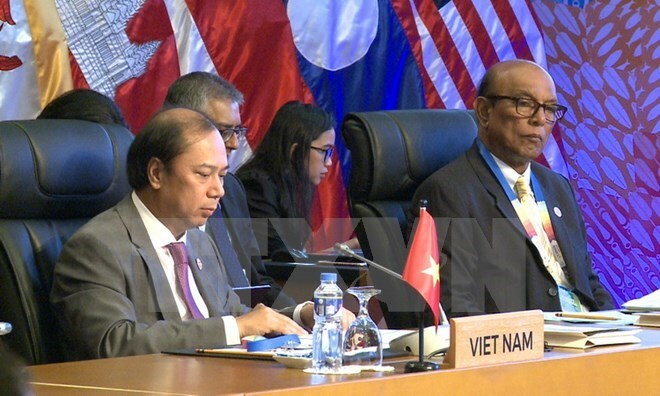 Manila(VNA) – Deputy Foreign Minister Nguyen Quoc Dung led a Vietnamese delegation to the ASEAN Senior Officials’ Meeting (SOM) and related meetings held in Manila, the Philippines on August 3-4. At the event, senior officials of ASEAN reviewed the implementation of the master plan for the building of the ASEAN Politics-Security Community and documents such as the Treaty of Amity and Cooperation (TAC) in Southeast Asia, the Southeast Asian Nuclear Weapon Free Zone Treaty (SEANWFZ), while updating the ASEAN Charter. They agreed on the need to exert more efforts to build a community of solidarity and unity with important contributions to peace, security and prosperity in the region. The officials also agreed on the agenda and important documents to be submitted to ministerial meetings, including a joint statement of the 50thASEAN Ministerial Meeting (AMM-50), and a declaration of the 50th founding anniversary of ASEAN. At the SOM ASEAN and partners, participants prepared agenda for the ASEAN Post-Ministerial Conference with 10 partners, the East Asia Summit, and the ASEAN Plus Three Ministerial Meeting, as well as activities to mark the establishment of relations between ASEAN and India, Canada, the European Union and the US. They also completed documents to be submitted to the ASEAN Ministerial Meeting, including the working plan for the 2018-2022 period within the ASEAN-Japan, ASEAN-EU and ASEAN Plus Three cooperation frameworks. The officials concurred to propose EAS foreign ministers to turn maritime cooperation into a priority for cooperation of the new action programme. As the coordinator for the ASEAN-India relations, Vietnam actively contributed to building the theme and documents of the upcoming summit commemorating the 25th anniversary of ASEAN-India ties in January 2018, while speeding up important cooperation projects and defining the roadmap for the signing of a memorandum of understanding on the formation of the AEAN-India Centre. On August 4, Deputy FM Dung also attended the SEANFWZ Commission Meeting and a meeting with representatives of the ASEAN Intergovernmental Commission on Human Rights (AICHR). At the SEANFWZ Commission Meeting, participants reviewed the progress of the action plan on strengthening the implementation of the SEANWFZ in 2013-2017, while agreeing to extend the plan to another five years from 2018-2022 to ensure the continuance of many cooperation activities. They also discussed measures to hasten States owning nuclear weapons to join the treaty. At the meeting with AICHR representatives, participants lauded the outcomes of the commission’s working plan for the 2016-2020 period, stressing the comprehensive approach and the promotion of disciplinary coordination to strengthen the efficiency of affiliation in human rights observation in the region, practically contributing to the building of the people-centredASEAN Community. On the sidelines of the meetings, Deputy FM Dung met heads of the Chinese, US, Australian, New Zealand and Philippine delegations.